My aunt Eva used to bring me one every year. She has been gone for over 15 years and I still think of it and miss her. This year I bought one and I am cheered just as much as if Eva had brought it to me. It’s just a simple thing of beauty giving us plenty of Christmas pleasure. We’re listening to them each day. There’s a wealth of promise and praise of Glory To God. We’re grandparents for the first time this year! And we’re thrilled. Found in the used clothing we were sorting for CAM. That rusty, old four-wheel drive puddle jumper will get us from here to there and back all winter, especially since my little red Buick needs a new transmission. Tell us what you’re thankful for this year. Hmmm, where to start… so many things to be thankful for! 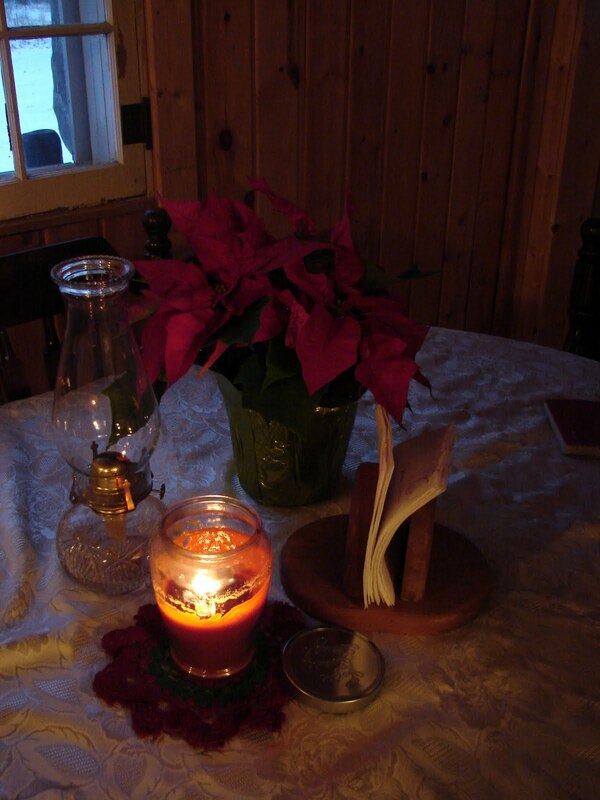 A warm house when it's cold and blustery outside, candles burning, health, family and friends, and much much more! I know that's kind of vague. I loved your list, esp the simple pleasures like a jar of peppermint candy. After seeing a bad accident along the way; I am doubling grateful for our safe travels last evening. For a new boiler that keeps us toasty warm. The bright sunlight on a white earth is a beautful scene and refreshes the soul. My own cozy home with my family all around me. I'm thankful for grateful people who choose to see the beauty that's still in this world. Something I am thankful for is the Christmas cards and pictures we have been getting in the mail each day… and I am especially thankful for the one Christmas letter we have gotten so far…from Grandpas Sid's. We've been tuning in to this grateful heart idea just lately. I'm thankful for friends. We've learned to know a lot of new friends this year. It's really stretched us in good ways, and also in ways we would not have chosen. So I am grateful for a Father who knows what we need.